oesophageal acid back flows. It is the remedy for gastric burns. Its disorders are worsened by night, there can be acid vomiting that can be associated with migraines. It is also used for child diarrhea. Argentum Nitricum: Silver nitrate which at homeopathic dilutions is especially used for hurried people with stomach ulcers worsened by stress. 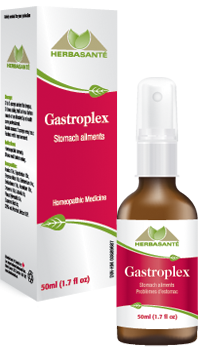 This homeopathic drug is used for gastric burns worsened by sugar and chocolate. The patient suffers from vertigo and is shaky. He can also have aerophagia and abdominal distension. This drug is especially used for hurried people for whom time goes by too fast. They can also have diarrhea with green stools. Lycopodium: Especially used as a constitution remedy for patients having sensitive livers with characteristically right laterality. Patient also has subumbilical flatulence and the abdominal walls are very distended. When sitting at the table, the person has a tendency to loosen his belt after the firSt bite. He is characterized with hepatic and digestive disorders with food intolerances. It is usually between 5 pm and 8 pm that he is the worst off. China: Is used in this case for abdominal distensions. It is complementary to lycopodium and vegetabilis. It is also used for diarrhea with fatigue. Anacardium & Antimonium Crudum: These are for people who eat so much that they get an indigestion. Colocynthis: In the medical world this is one of the antispasmodics. Spasms are reduced in a bent over position. Colocynthis is complemented by belladonna. Belladonna: Is an antispasmodic when used in measurable doses. In a homeopathic dosage, it is used for fever, pains, and facial congestion. Artemisia: Stimulates digestion and has eupeptic and aperitive properties.